SECAUCUS, NJ — High Tech High School’s Apiculture class and Hive Tech Honey Club hosted a table at the Secaucus 6th Annual Green Festival on May 7th. High Tech students helped spread awareness about the ever-growing threat to the honey bee population by sharing the results of their research on High Tech’s own apiary, which explored topics such as mite infestation and Colony Collapse Disorder. 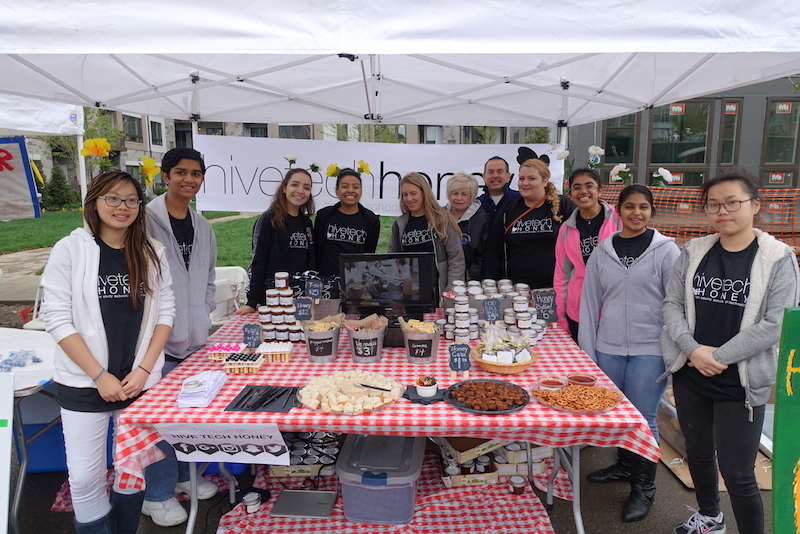 In addition to presenting informational and educational pamphlets, the High Tech students sold Hive Tech Honey products, including food items from the Culinary Arts department, such as honey butter, honey cakes and honey mango habanero BBQ sauce. They also sold Hive Tech Honey t-shirts and wristbands. The school’s science department sold their all natural line of products including peppermint, lemon, and orange infused lip balms made from Hive Tech Honey beeswax. Most importantly, Hive Tech Honey was to be made available to the public for the first time. This all natural and locally sourced honey is the culmination of High Tech students’ dedication and commitment to urban beekeeping. All profits from the sale of Hive Tech Honey products will be used to further maintain, grow, and sustain High Tech High School’s Apiary for research and product development.